Mayfield completed 22 of 36 passes for 180 yards, two touchdowns and an interception during Sunday's 33-18 loss to Pittsburgh. 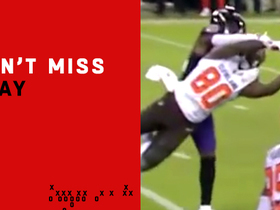 He added a nine-yard run during the contest. Mayfield completed 23 of 34 attempts for 215 passing yards and two touchdowns, adding 43 rushing yards on four carries during Sunday's 26-23 overtime loss to the Buccaneers. Mayfield (ankle) isn't listed on the Browns' initial injury report ahead of Sunday's game in Tampa Bay. Analysis: Mayfield had a sore ankle after the 38-14 loss to the Chargers in Week 6, but it apparently isn't serious enough to warrant mention on the injury report. He'll look to bounce back in a prime matchup, facing a Buccaneers defense that ranks dead last in passing yards allowed per game (356) and per attempt (9.3) this season. The Bucs did fire defensive coordinator Mike Smith on Monday, but they still have major personnel deficiencies in the secondary. 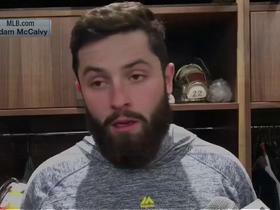 Mayfield is dealing with a sore ankle in the aftermath of Sunday's 38-14 loss to the Chargers, but the injury isn't expected to prevent him from playing Week 7 against the Buccaneers, Ian Rapoport of NFL Network reports. Mayfield completed 22 of 46 passes for 238 yards with a touchdown and two interceptions during Sunday's 38-14 loss to the Chargers. He also ran the ball twice for eight yards. Mayfield completed 25 of 43 passes for 342 yards with a touchdown and interception during Sunday's 12-9 overtime win over the Ravens. He also ran twice for 23 yards. Mayfield completed 21 of 41 pass attempts for 295 yards, two touchdowns and two interceptions Sunday against the Raiders. He also carried four times for 10 yards and lost a pair of fumbles during the 45-42 overtime loss. 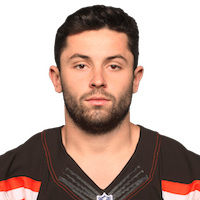 Head coach Hue Jackson officially announced Mayfield as the Browns' starting quarterback Monday, Scott Petrak of the Elyria Chronicle-Telegram reports. 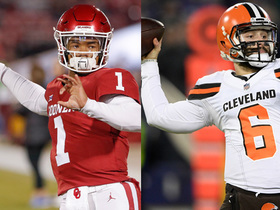 Coach Hue Jackson is expected to name Mayfield the Browns' starting quarterback Monday, May Kay Cabot of The Cleveland Plain Dealer reports. Mayfield completed 17 of 23 passes for 201 yards with no touchdowns or interceptions after replacing Tyrod Taylor (concussion) in the second quarter of Thursday's 21-17 win over the Jets. 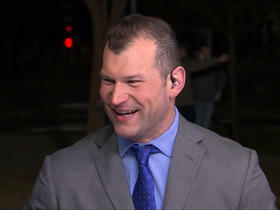 He also lost two yards on his two rushes, fumbled once and completed a two-point conversion pass. Mayfield completed nine of 16 passes for 138 yards during Thursday's preseason game in Detroit. 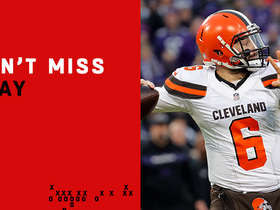 Analysis: Mayfield played the entire first half and led the Browns to 17 points on five drives. He completed 35 of 61 passes (57.4 percent) for 501 yards (8.2 YPA) this preseason, with two touchdowns, an interception and 11 carries for 34 yards. Tyrod Taylor will get the Week 1 start, but Mayfield's solid work in August may leave the 29-year-old on a short leash. Mayfield could play the entire first half of Thursday's preseason game against the Lions, Scott Petrak of the Elyria Chronicle-Telegram reports. Analysis: Coach Hue Jackson confirmed that Mayfield will get the start, with potential to continue playing through the end of the first half. Jackson recently said he's leaning toward Mayfield over Drew Stanton to open the season as the team's No. 2 QB behind starter Tyrod Taylor. Coach Hue Jackson said he's leaning toward having Mayfield serve as the Browns' No. 2 QB this season, Mary Kay Cabot of The Cleveland Plain Dealer reports. Coach Hue Jackson said Mayfield will play in Thursday's preseason finale in Detroit, Nate Ulrich of the Akron Beacon Journal reports. Mayfield cleared concussion tests during Thursday's 5-0 preseason win over the Eagles, Mary Kay Cabot of The Cleveland Plain Dealer reports. Mayfield completed eight of 12 passes for 76 yards and an interception during Thursday's 5-0 win over the Eagles. He added 10 yards on three rushes. Coach Hue Jackson said Mayfield "will play quite a bit" against the Eagles on Thursday, Mary Kay Cabot of The Cleveland Plain Dealer reports. Mayfield completed seven of 13 passes for 75 yards and took four carries for nine yards in Friday's 19-17 preseason loss to the Bills. Mayfield should again see a significant amount of playing time during Friday's preseason game against the Bills, Mary Kay Cabot of The Cleveland Plain Dealer reports. Mayfield completed 11 of 20 passes for 212 yards and two touchdowns while rushing three times for 13 yards in Thursday's 20-10 win over the Giants to open the preseason. 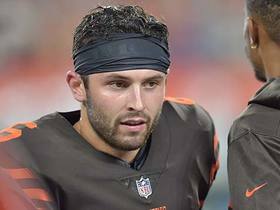 Mayfield will play at least two quarters in Thursday's preseason game against the Giants, Scott Petrak of the Elyria Chronicle-Telegram reports. Analysis: Moreover, coach Hue Jackson noted that he'd decide during Thursday's game if Mayfield will go any deeper than that. 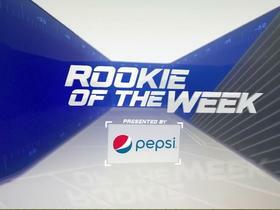 Those looking for an intriguing DFS roll of the dice this week can thus consider the No. 1 overall pick in April's NFL draft, as he'll get a chance to put up some stats Thursday. 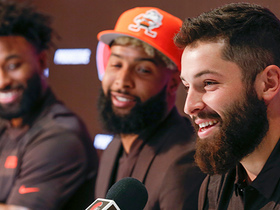 Coach Hue Jackson said Mayfield "will play quite a bit" in Thursday's preseason game against the Giants, Mary Kay Cabot of The Cleveland Plain Dealer reports. 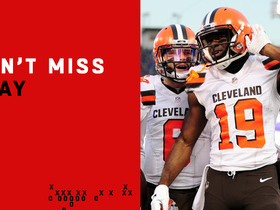 Coach Hue Jackson doesn't envision Mayfield getting much work with the Browns' first-team offense in training camp, Andrew Gribble of the team's official site reports. 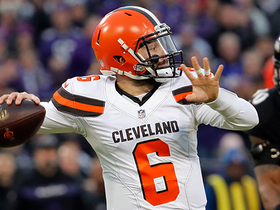 Mayfield signed a $32.68 million fully guaranteed contract with the Browns on Tuesday, Ian Rapoport of NFL Network reports.